16 Sep 1943: VB-145 deployed to NAF Natal, Brazil, under the operational control of FAW-16. Routine patrols, convoy coverage and ASW missions were assigned to the squadron over the offshore waters of the Caribbean convoy lanes. 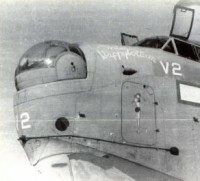 Patrols were coordinated with VB-107, a Liberator squadron assigned to Natal. Shortly after arrival, the squadron sent its aircraft, two or three at a time, to Ibura Field, NAF Recife, Brazil, where the fleet air wing had its principal maintenance facilities. 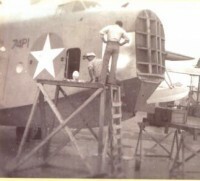 The aircraft were stripped of all unnecessary gear; armor plate was repositioned from the back to the bottom of the aircraft to protect against U-boat AA fire; bomb bays were equipped to carry six 350-pound bombs and dorsal turrets were locked in the forward firing position to supplement the nose guns when attacking surfaced submarines. 1 Nov 1943: A detachment of aircraft was sent to NAF Fernando de Noronha Island, 209 miles northeast of Natal, Brazil, for barrier sweeps. Aircraft did not remain on the island throughout the deployment, only when intelligence indicated that a submarine might be making a transit homeward. 13 Nov 1943: Lieutenant E. M. Jones and his crew were forced to ditch at sea after their radio compass failed. Jones had taken the wrong bearing until too much fuel had been consumed to make landfall. After the squadron searched the area for six days, hope was given up of finding the crew. Finally, on the seventh day, the crew drifted ashore and was saved. 21 Jun 1944: VB-145 aircraft were sent to NAF Recife for retrofitting with rocket launching rails. Rocket training was then undertaken by all flight crews at NAF Maceio, Brazil, firing live projectiles at offshore targets. 27 Aug 1944: Lieutenant (jg) C. W. Bleicher and his crew were returning from a patrol and lost their bearings while en route to base due to radio compass failure. With only a few minutes of fuel left, the pilot set the Ventura down in shallow water off the beach approximately 70 miles south of Fortaleza, Brazil. Only one crew member was injured in the crash and all exited the aircraft safely. 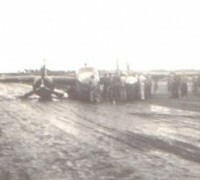 An Army B-25 spotted the wreckage 10 minutes later and the crew was eventually rescued. 5–14 Sep 1944: A four-aircraft detachment was sent to Ascension Island. The Venturas had been specially equipped with bomb bay tanks to extend their range on patrols. 5 Dec 1944: A three-aircraft detachment was sent to NAF Aratu, Bahia, Brazil. It returned to NAF Natal on 23 January 1945. 1 Feb 1945: VPB-145 was relieved at NAF Natal by VPB-126 and sent to NAF San Julian, Cuba.